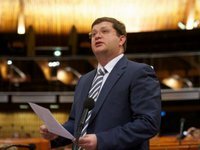 Verkhovna Rada deputy (Bloc of Petro Poroshenko - BPP) Volodymyr Ariev has said that some $41 million in PrivatBank were transferred to the accounts of Kvartal 95 Studio belonging to Volodymyr Zelensky. Ariev said funds were transferred when businessman Ihor Kolomoisky owned the bank. "Some $41 million of PrivatBank depositors' funds were transferred to the comedian's Kvartal 95 Studio through lending to Kolomoisky-related companies. Everything happened according to the standard for the oligarch scheme that Kroll investigated after the withdrawal by Kolomoisky and Co. of $6 billion of depositors' funds and funds that were used for refinancing the bank from the reserves of the National Bank of Ukraine, when the bank began to collapse under the weight of the pyramid created by the owners," Ariev wrote on his Facebook page last week. According to him, in 2012, PrivatBank issued loans worth over UAH 400 million (at the rate of UAH 8/$1) to Realism Oil and Karpatnaftotrade Trade House LLC, which are part of the Privat group of Kolomoisky. "In few seconds, these funds appear on the account of PJSC Ukrtransnafta, whose management was also controlled by Kolomoisky. The head of Ukrtransnafta at that time was Oleksandr Lazorko – the head of other companies of the Privat group and also known for manipulating pipeline oil and placing it on storage at refineries of the Privat Group," the people's deputy wrote. He said that within a few days, $38.2 million was pulled from Ukrtransnafta to the accounts of Transit SA in the bank's Cyprus branch. The company is registered in Switzerland by Kolomoisky (32.5%), Hennadiy Boholiubov (32.5%) and Ihor Surkis (25%). "Further, Transit SA drives these funds through four offshore companies registered by persons who represent Kolomoisky's interests and are only nominal owners of these companies. As a result, $41 million is deposited in the accounts of Godfrey Consulting Limited, registered by Serhiy Melnyk, another representative of nominal holders. He "owns" more than 40 companies that have accounts with PrivatBank in Cyprus, and is a member of the editorial board of the associated company TK Privat TV Dnepr and director of several companies of the Privat Group, Ariev said. According to the parliamentarian, having passed through offshore companies, the funds reached the companies registered by members of the Kvartal 95 Studio, namely: Andriy Yakovlev, Borys and Serhiy Shefir, Serhiy Trofimov and Volodymyr Zelensky. Further, according to Ariev, the funds were placed on deposits and then withdrawn from the bank to the accounts of companies outside the bank, which makes it impossible to keep track of them. In 2012-2016, all funds were transferred to the following companies or accounts of individuals: Dr. Robert Walz (DE), Pinehill Investment Holdings Inc., Lacrontra Unitrade LLP (the U.K.), Piper Smith Watton LLP (the U.K.), Candlewood Investments Limited, Triapos Limited (Cyprus), SHSN Limited (Belize), Atrazon Limited LTD (Cyprus), Maintrade Limited (Seychelles), Panevest End Co SA, (Panama), Aldorante Limited (Cyprus), and Film Heritage Inc. (Belize). "It should be emphasized that all companies are registered in offshore zones. The ultimate beneficial owners of these offshore companies are unknown, except for the last two – Cyprus Aldorante Limited and Film Heritage Inc. (Belize). They are registered by Zelensky, according to the candidate's declaration. Some $41 million was pulled from PrivatBank in parts, since 2012, from the moment of cooperation between Kolomoisky and Zelensky," the people's deputy said.